You knew that day would come, it's here now. Steve Jobs has resigned. And why I'm sure the press, companies and the devotees will now praise him, or burst into tears, I'm not. I know Apple from the first time, Jobs where at Apple. Then he got fired, and everyone, including me, were sad and furious about it. Apple then had hard times, and nearly vanished from the market at some point. Jobs' comeback was big and he led Apple to new heights. He led. Right. Rigorous, regardless of consequences and give a crap about the ties of the company. He created, stronger then before, a cult, a church-like community that even denies obvious flaws or any error. Under his vicious command, blogger were sued, suppliers humiliated in public and the competition defamed. 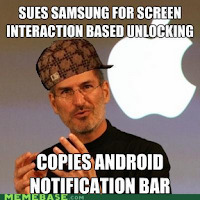 It was about time, that he leaves Apple. But what is left from the old Apple, the good Apple. The one we once had as an island of colors, far away from the evil money-suckers, Apple once called their enemy? After transforming into the new "IBM", what is left that can make Apple once again be a friendly company, instead of patent-trolling and suing others, while having zero innovation beyond the court? Isn't it too late? I fear that the resigning of Jobs doesn't change much in the next years. Too much of evil doings have already occurred. You can't jump from that scale of villain to be a good company again. This will take time. But danger lies ahead of Apple. The Stock market isn't amused of Steve Jobs leaving Apple. And why should they? Where only money counts, it's a bad thing that he left. And that's why the Jobs' centric view of devotees and some pathetic companies, are now shattered. Now without "Steve's Reality Distortion Field" and looking like an evil, suing and patent-trolling machine, it will get tough. It's most important business is under heavy fire from Android. More and more business practices of Apple are attacked by governments all over the world, and the bad PR draws more and more people away. Still, Apple makes one sales record after another, but for how long? After all bad things I said about Steve Jobs, one good has to be said. He was a brilliant money maker. He knew how to squeezes the last cent out of customers bags and even made them feel good about it. He made people talk about freedom, while putting themselves in the Apple-Cage and felt protected. That's what I call a good business man. But I hope he remembers another time. A time when he and Apple doesn't wanted to rule the world with an iron fist, but to make some people happy, and giving them the feeling, not spending their hard earned money on an evil company.